Love this for its subtlety, double meaning, as well as possible irony. If you’re buying for me, I’ll take a medium. Not sure if the book lover in your life would rather stay home and read on a Friday night, but if that’s the case, then this is a perfect book for her! 2. Get your book crafty on. . .
Here’s a Youtube video for a quick and easy bookmark that clearly denotes Book Lover. Try a little origami gift if you want or need to go inexpensive. 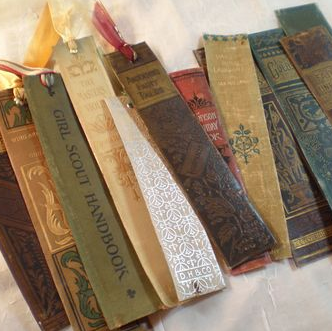 These super simple book marks might require a quick trip to the used book store, but what a unique idea for a bookmark. There are such great items available with favorite book quotes. If she is truly a book lover, there will be certain quotes she will never tire of reading. In fact, they inspire her and so will this jewelry. This one is for the Louisa May Alcott fans. This pendant is such fun! The best part is there is a ton of Jane Austen-inspired pieces that any book-freak would love. For a book enthusiast there’s nothing much better than the smell that emanates from a book store. Try out these book-inspired candle scents. There’s even an scent for the trashy-romance novel. Wanna spice things up for the mother of your children? Then try out this coffee mug! Check out these sites for more book-inpsired gifts. You’re sure to find something that mom would love. Out of Print Clothing has tons of t-shirts and accessories highlighting some of the best book ever written. Not on the High Street features a section just for BookLovers: bookmarks, e-reader covers, art, glasses case, totes and phone cases. Amazon.com obviously has tons of gifts for that book fanatic in your life. Simply type “book lover gifts” in the search box and you have tons of great Mother’s Day gift ideas. This entry was posted in Spiritual Encouragement on April 8, 2015 by aliciachall28.